Not many people know this, but I am die-hard fan of manga/anime. However, this is the first time I have seen the genre adapted for the big screen. Anime is Japanese animation that is mostly geared toward adults but also entertains children as well. Ghost in the Shell was first introduced as a manga in 1989 and soon after evolved into its anime format. But don't worry, you don't need to be familiar with anime or the 80's version of this story to enjoy this new flick. Everything is explained throughout the movie. I went in with a bit of fear that I would be lost, but I left with a smile. 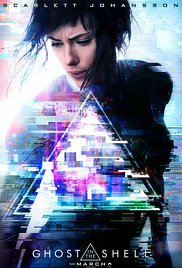 Scarlett Johansson plays a character named 'Major' who has gone through a successful operation that implanted only her brain in a robot. She is an android and is known as being a ghost in shell. She is placed in a group of elite soldiers to fight crime, and she is a rare asset to the company that made her. But if she ever strays off on her own she is to be eliminated. She has no recollection of her past, and we get to find out alongside her what really happened and how she ended up the way she is now. I really liked the story and I felt that it flowed very well. The action in a futuristic setting made it that much better. The visuals and the score kept me hooked from beginning to end. Give this movie a chance because it's worth seeing on the big screen. I did not see it in IMAX, but I hear it's much better that way. But however you see it, you might just walk out liking it like I did.